Despite being just a thin strip of hardwood glued down to the neck, a fretboard is one of the guitar’s most important components. It’s the contact point between the notes you play and the body of the guitar—the stabilizing bedrock of the frets. It’s also the piece of the guitar that comes in contact with your hands most frequently and gets the dirtiest as a result. If left uncleaned, buildup from the fretboard can work its way onto the strings, limiting their ability to resonate and significantly impeding your guitar’s sonic performance. Whether your frets are pressed into elegant and streaky ebony or directly into the pine neck like Leo Fender and Doc Kauffman used to do, it’s a good idea to keep the foundation of your frets clean to prevent this from happening. 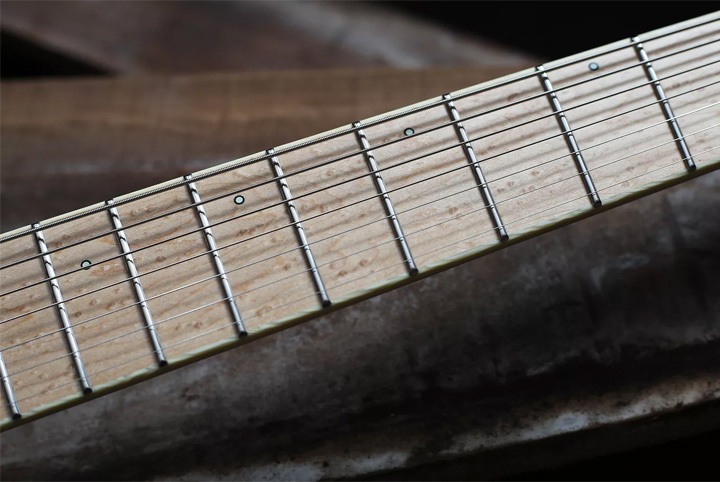 Below, this guide will walk through the process for cleaning and maintaining three common fretboard varieties: unfinished wood, finished wood with unfinished frets, and completely lacquered necks. Be sure to look up your model’s specs before you start cleaning to ensure that you’re using the right products for your guitar’s fretboard. Below is a list of crucial materials for fretboard cleaning and general guitar maintenance. Altogether, everything on this list can be acquired for less than $50. Naphtha (Ronsonol/Zippo lighter fluid also works): Naphtha (and lighter fluid, mineral spirits) is a solvent often used for breaking up oils, like the stuff your fingers leave behind on the fretboard. What makes it great for guitar cleaning is that it doesn’t react with nitro or poly finishes, and it evaporates quickly without causing wood to expand. Just be sure to use caution when working with it—use a paper towel or cloth to apply it, and and don’t let it near an open flame. Music Nomad Guitar Detailer: This is a standard guitar polish made up of various solvents and mineral oils that are excellent at cleaning up filth and leaving behind a clean sheen. Any guitar polish will do the trick here, but I like this brand because I think it smells better than Martin’s. Music Nomad F-ONE Oil: As with the polish, any fretboard oil will do. The main difference between brands is in viscosity, and unless you’re dealing with vintage instruments, it’s nothing you need to worry about. I’ve seen people do just fine using cutting board oil. Miscellaneous Items: Paper towels, microfiber cloth, #0000 final finish/super fine steel wool, and a few fretboard guards (they go missing easily). In addition to the list of things you do need, there are also a few things that should absolutely never be used to clean your guitar. Acetone/Nail Polish Remover: Naptha is okay to use because it doesn’t react with guitar finish. Nail polish remover (acetone) is specifically designed to strip that kind of lacquer or finish. It’s a great thing to use for cleaning up excess glue or for removing binding from a guitar body or neck. But it should not under any circumstances be used as a cleaning agent—especially on a fretboard. Pledge or Wood Polish Spray: Lemon oil is a great thing to use on fretboards, especially to return a dark sheen to the wood if it’s dried out. But the aerosolized wood polishes like Pledge usually contain solvents that can be harmful to the guitar’s finish. I’m all about using household products to take care of guitar repair tasks, but it’s sometimes best to stick with the stuff that was designed for instruments. 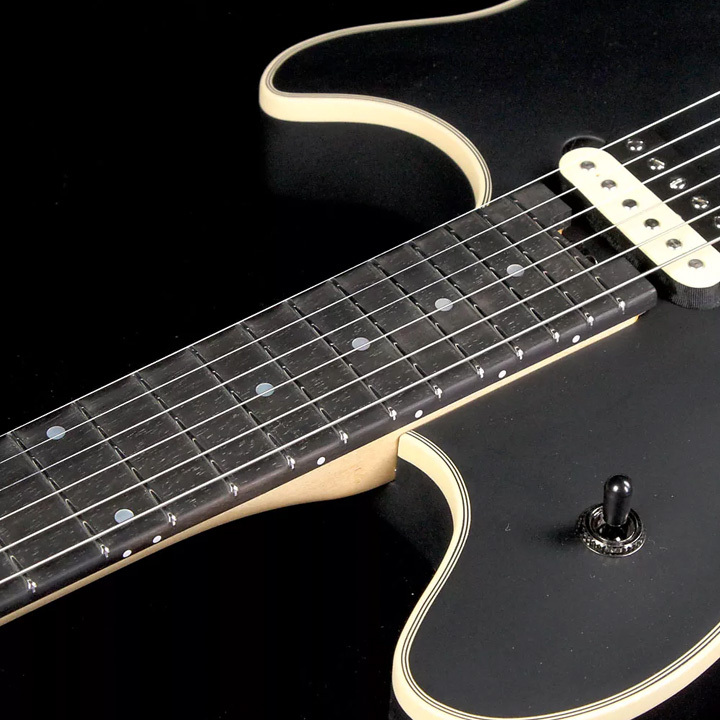 Sandpaper: You’ll hear more about different fretboard varieties and the different ways to clean them later on in this piece. Sometimes, a player will like the shape and feel of a neck but hate the finish. Sandpaper comes in handy if the player wants to strip the finish from a fretboard or neck. But that’s really the only reason you ought to use sandpaper on a neck. It’s just too abrasive. Even 800-grit will create hills and valleys in the fretboard, or worse, create uneven wear on the frets. If you’re going to use an abrasive material on a fretboard, just stick to steel wool. Any Steel Wool Other Than #0000: The brand of steel wool doesn’t matter, but the gauge does. Look for “#0000” or “super fine” steel wool at any hardware store, paint shop, or online retailer—don’t use the stuff you use to clear off scrambled eggs from your cast iron. Once you’ve gathered all of the right materials, make sure to find a good space for deep cleaning. It helps to have a wide, flat surface measuring approximately five times the amount of space you think you’ll need. Spread out. Clear off your workbench, kitchen counter, dining room table, pool table, etc. This is more of a take-your-time kind of chore, so maybe grab a beverage before you start. Long ago, somebody figured out that dense hardwoods make the best fretboards. It makes sense: you want the tightest grain and the heaviest wood to press your frets into or to carve into a tongue extension. After a few centuries of design, innovation, and an industrial boom, contemporary guitar builders gravitate toward two favorites for unfinished fretboards: rosewood and ebony. Structurally, these are some of the densest and hardest woods, making them ideal fretboard material. But as a result of skyrocketing demand over the last century, they’ve been overcut. Brazilian rosewood is on the International Union for Conservation of Nature “red list” and has been for ages. Don’t forget that climate change affects guitars, too. All the more reason to take care of the ones we’ve got. Slack and remove strings: Don’t worry, this won’t hurt the guitar at all. Remove neck, if bolted on: This doesn’t hurt the guitar, either. We’re about to run steel wool, soap, oil, and all kinds of gross stuff up and down the fretboard, and this’ll keep it from ending up in the neck pickup cavity. If you’re working on a set-neck guitar, cover the neck pickup with a cloth or masking tape. If you’re working with an acoustic guitar, just cover the soundhole with a cloth. Spread one capful of Murphy’s onto the frets: Just a thin streak from the nut to the 22nd fret, or the 24th fret if you’re a shredder. With steel wool, immediately start scrubbing the soap in tight circles: Vegetable oil soap gets tacky pretty quick, so it’s important to start scrubbing as soon as the cap goes back on the bottle. Keep the scrubbing in small, tight circles. DON’T scrub directly against the grain, as it takes more material out of the fretboard than you’ll want and leads to an uneven playing surface. DON’T scrub with the grain, either—if there’s considerable debris on your fretboard, longer steel wool passes going with the grain will only push debris farther into the wood. The best method with oil soap is to cut the difference, keeping the scrubbing pattern to a tight, circular motion, getting under the gunk, but not shaving away wood from your fretboard. Wipe clean with paper towels: Make sure you get it all. Try not to look at the paper towel after you’re done. Position the fretboard guard over each fret, scrubbing the fret’s surface with steel wool: Metal and wood react differently to gunk. While wood accumulates filth slowly over time, metal tends to corrode. As such, it’s important to clean the frets as well as the fretboard. Hit each one with some steel wool, and bask in the glowing, glimmering frets when you’re through. Wipe every polished fret with a naptha-saturated paper towel: Lighter fluid will get rid of any stragglers left behind. Again, use with caution: always apply with a paper towel and don’t get it near an open flame. Apply a thin strip of oil to the fretboard, work in gently with a paper towel: “A lil dab’ll do ya.” Don’t go ham on the squeeze bottle and slather your fretboard with grease. Fretboard oil should just act like a polish on your freshly cleaned fretboard. Squeeze out a strip as wide as a phone charger cable, and scrub it in with paper towel. With a microfiber cloth, buff the bejeezus out of the fretboard: This not only cleans off the remaining bits of debris but also distributes the oil more evenly across the fretboard. This is a process better done by hand than a machine. Buffers do a great job with flat surfaces, but radiused fretboards require a little more dexterity to get around frets. Wipe each fret hard with a paper towel: A little bit of oil on unfinished wood is a good thing, but oil on frets will kill your strings. A microfiber cloth with help spread the oil around, but a paper towel will absorb it right off the fret. Maple is a beautiful wood. It’s strong, resilient, widely available, largely sustainably grown and harvested, and cheap as hell. If you can get your hands on an older piece of timber with a super-tight grain, the wood gets an almost iridescent shimmer when it’s sanded. It’s for all these reasons that maple became a favorite material for guitar builders early on. To preserve the bright color, most modern manufacturers will spray maple fretboards with finish before the frets are pressed in. The finish reacts with the wood, acting as a light stain that yields the distinctive yellow-gold maple necks we all know and love. The finish, whether nitrocellulose or polypropylene, acts as a protective barrier between the players’ fingers and the wood. Some players like this, and others like the feeling of bare wood under their fingers. It’s really a matter of personal preference—much more about feel than tone. Remove neck, if bolted on. Spread one capful of Murphy’s onto the frets. With a paper towel, immediately start scrubbing the soap in tight circles: No steel wool here. The abrasive stuff tends to leave swirls and scratches in its wake. It’s best to stick to the gentle materials when working with finish. If you have some really stubborn gunk on a finished board, naptha is 100 percent okay to use, but be careful with scraping, scratching, or putting anything sharp on the fretboard. Wipe clean with paper towels. Position the fretboard guard over each fret, scrubbing each surface with steel wool. Wipe every polished fret with a naptha-saturated paper towel. And you’re done. Seriously, no need to over-work yourself in cleaning a finished board—the lacquer is there to protect the wood, and all you need to worry about is keeping that lacquer clear of any debris. Let the finish do the heavy lifting. In addition to the manufacturers that like leaving fretboards bare and manufacturers that like applying lacquer before pressing are those that like to spray the whole neck with finish after its completed—frets and all. Rickenbacker does this a lot, as well as Gretsch for some of the mainstream models. Spray guitar detailer into a microfiber cloth, and polish entire neck: No need for oil soap here. Each fret usually has a thin layer of finish either on it or around it. The main goal in cleaning a completely lacquered board is to clean the finish itself rather than the wood underneath it. Feel free to use naptha if there’s a significant amount of cheese on the board or if you have some stubborn grime stuck to a spot. That’s really the only step in cleaning a lacquered board. As a finished fretboard goes through typical wear and tear, it’s important to keep an eye on the finish covering the frets. If you see spots where the finish is flaking away from the frets, it might be time to take a razor blade to the fret-tops to clear the finish off of each one. Alternatively, you could try your hand at a fret dressing, with a radiused sanding block and a set of fret files. While those procedures tend to require a little more experience to pull off, they’re fairly straightforward, and can be learned easily. Now, to answer the question you’ve probably been asking yourself this whole time, how often you have to do this really depends on you as a player. The player who spends fifteen minutes a day with their guitar will naturally have less to deal with than someone who practices in the morning, teaches in the afternoon, and gigs at night. It’s also worth mentioning that many of the reasons a guitar would need a deep clean in the first place can be avoided—or at least postponed—if the player regularly wipes the instrument down after gigs or practice sessions. Keep a microfiber rag in your case or gig bag, and just wipe the strings down before putting it away. Ultimately, the best way to keep your fretboard clean, preserve the life of your strings, and avoid having to scrub your fretboard every month is to wash your hands before you play." Storing the strap and guitar in separate compartments is another great way to avoid getting the guitar filthy. Your strap acts like a sponge and wicks up moisture as you play, so if you leave that moist strip of cowhide in your guitar case with an unfinished rosewood fretboard, you’re setting yourself up for a gross mess. But ultimately, the best way to keep your fretboard clean, preserve the life of your strings, and avoid having to scrub your fretboard every month is to wash your hands before you play. This trick is just basic common sense, but the difference in fretboard cleanliness is astronomical. Assuming you’re doing these things to keep your guitar clean between gigs and practices, I would suggest cleaning the fretboard every third or fourth re-string. The important things to remember are to spread out, take your time, use the right materials, and learn as much as you can in the process.